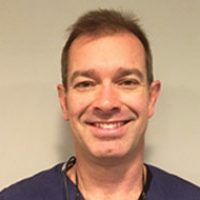 Dr. Dirk Vice is a graduate of the University of North Carolina at Chapel Hill School of Dentistry, with a master’s degree in cellular and molecular biology. He chose this career when he realized he had a passion for service and for creating with his hands as well as his mind. Dr. Vice considers his work akin to sculpture. He also has a passion for healing. The ability to eliminate someone’s pain and discomfort or to allow someone to be infinitely proud of a beautiful smile that functions flawlessly is his definition of job satisfaction. Dentistry is the one career he knew would satisfy him on a professional level. Started out as undergraduate at UNC, University of North Carolina in Chapel Hill. I got a master's degree at East Carolina University in cardiac physiology. I was going to use medical school as a backup if I didn't get into dental school, but I got into dental school at UNC Chapel Hill. I went back to UNC for dental school there. My first year out of dental school I went and did a fellowship program with a guy named Carl Misch who did write the book on implant dentistry. I spent hundreds upon hundreds upon hundreds of hours with this man, this guru of implant dentistry. Having an implant in the toolbox of everything that we do because people don't want a filling or a crown or an implant. They just want their teeth to work, so having that tool available to me allows me to do that relatively easily. Somebody in this office needs a filling we do a filling. It's not a big deal. If someone in this office needs an implant, we do an implant. It's not a big deal. It can be painless. It can be quick. It works great. It's not something that everybody has that ability to do with such ease. A lot of places you have to go to three or four different providers to have the implant done before you're able to chew on it. Here, we've got one doc, does the whole thing start to finish from a simple single tooth case to replacing every tooth that you have and putting a new one in. We can do that over time, we can do it immediately, whatever's best for you. The focus of Dr. Vice’s professional interests lies in the emerging art and science of dental implants. Implants can be used to stabilize a loose denture or give someone back a lost tooth. Until science learns to regrow teeth, implants are a beautiful and effective treatment. Dr. Vice’s personal interests lie in the outdoors. Because he is in a profession that demands constant and intense concentration, he likes to balance his life with a great deal of physical activity, such as mountain biking and skiing.